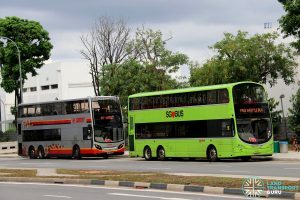 The Joo Koon—Gul Circle Shuttle Bus Service was a Rail Replacement Service plying between Joo Koon and Gul Circle, serving bus stops at the affected East West Line (EWL) stations. The route was activated to operate daily till 27 May 2018 (except Sundays from 29 April to 27 May 2018 due to the East West Line New Signalling System Full Day Trial), as the EWL remains partially suspended until re-signalling works are complete. To enable engineers to carry out further assurance checks on the new signalling system, train services between EW29 Joo Koon and EW30 Gul Circle were suspended from Monday, 20 November 2017 till 26 May 2018, except on Sundays between 29 April to 27 May 2018 for the full day trial of the New Signalling System. This arrangement is done to separate the old signalling system-equipped section between Pasir Ris and Joo Koon from the new signalling system-equipped section between Joo Koon and Tuas Link, hence no longer requiring trains to switch signalling systems at Pioneer (Tracks between Pioneer and Joo Koon can be operated on either the old or new signalling system). On 21 Nov 2017, the Land Transport Authority mentioned on their Facebook post that the arrangement is expected to continue until the East West Line re-signalling works are completed in 2018 when the entire EWL, including the Tuas West Extension (TWE), can be operated on the new CBTC Signalling System. 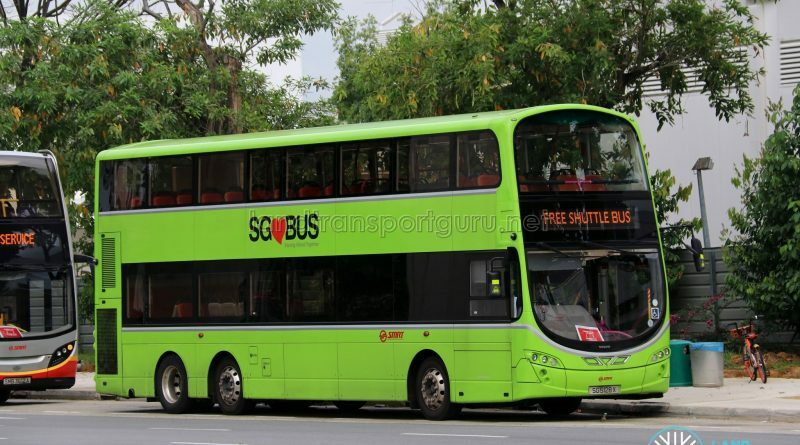 Shuttle Services were initially operated by Tower Transit, SBS Transit & a minority of SMRT Buses. 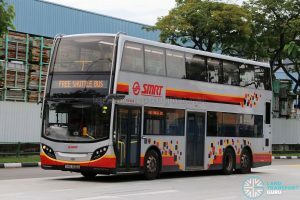 Starting from December 2017, the SMRT Buses became the anchor operator of the Shuttle Bus Service, running buses throughout the day and reflecting it as “JKGC” in bus timetables. 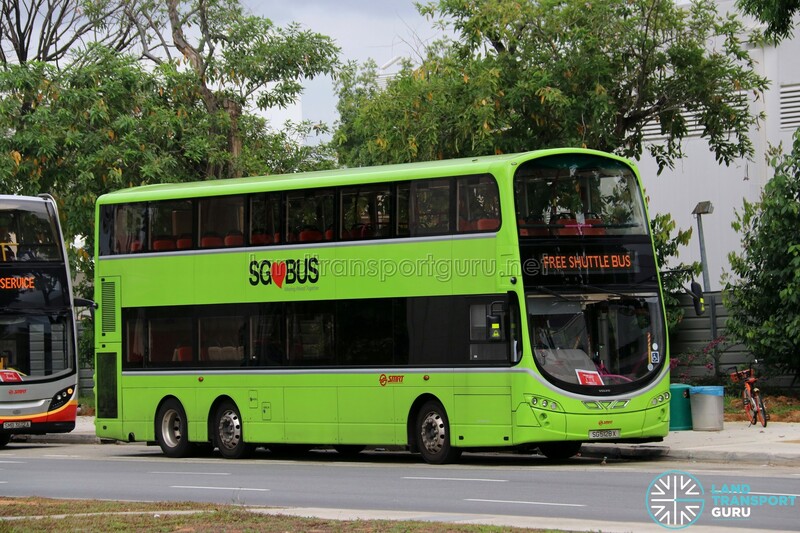 SBS Transit & Tower Transit also operate supplementary trips of the Shuttle Service during peak hours on Weekdays. The Free Shuttle Service did not operate on Sundays from 29 April to 27 May 2018 (inclusive of 06 May, 13 May & 20 May) during the East West Line CBTC Signalling Trials, as train service will available between Joo Koon and Gul Circle. With weekday testing of the new signalling system on the East West Line taking place from 28 May 2018, the last day of operations for the free shuttle service was on Saturday, 26 May 2018. Fare: Free Rides for all commuters. Commuters can also tap out of the train at Joo Koon and re-enter the train at Gul Circle (and vice versa) without incurring a transfer.